I was looking forward to heading into the West Bank Sunday, to interview a rabbi who runs a yeshiva in the Israeli settlement town of Shilo. My fixer, Oren Rosenfeld, a veteran journalist who has worked for many international news organizations, including the BBC, was going to drive me there and help with translations. It wouldn’t be my first time entering Palestinian territory, but it would be my first in a controversial settlement town. But Oren called midday Saturday, telling me it would not be safe for us. 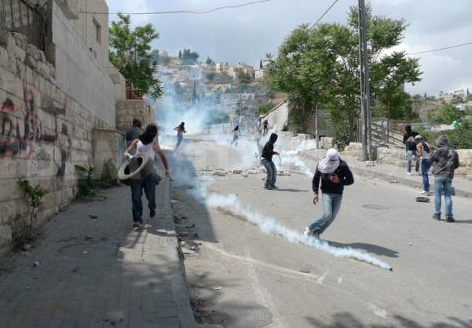 He’d spent Friday in the town of the east Jerusalem neighborhood of Silwan, covering riots that had broken out. A 17-year-old Palestinian boy was shot to death by guards of Jewish settlers living in Beit Yonatan, an apartment building. Oren told me rioters had thrown tear gas into the building and set it aflame. Guards were trapped inside, so they shot their way out and one of the bullets hit Milad Ayache in the abdomen. He died at a hospital a few hours later. News reports including this one from ynetnews and this one from Al-Jazerra English do not have these details. The funeral was held today and there were clashes with police, resulting in multiple injuries. Oren said Ayache’s death would stoke anger among Palestinians Sunday, which was also Nakba Day, the annual day that Palestinians protest the establishment of Israel, which forced 700,000 Palestinians to flee the country and led to the creation of the occupied territories. Agreed. He’s going to call the rabbi tonight, after sunset, the end of Shabbat, to rearrange our meeting. Hopefully in a few days the rioting will subside and I’ll be able to visit Shilo and see the yeshiva where the rabbi teaches.